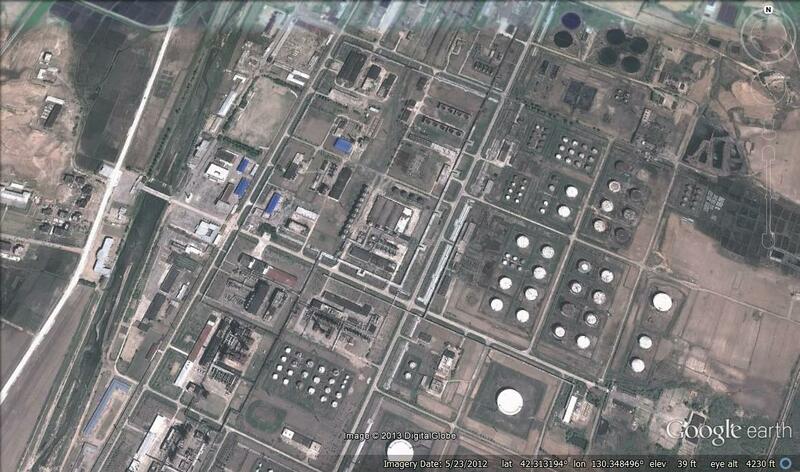 Pictured above (Google Earth): The Victory (Sungri) Refinery in Rason, North Korea. “HBOil JSC … hereby refutes the South Korean publication known as ‘KOREA JOONGANG DAILY’, for irresponsible reporting and dissemination of erroneous news on 23 March 2016; asserting that HBOil JSC has withdrawn from its joint venture in the Democratic People’s Republic of Korea,” the statement read. HBOil entered into a joint venture with North Korea in 2013 and has attempted to make inroads into North Korea’s undeveloped oil and gas sector. The company has since invested in projects that could give it access to upstream oil and gas production and downstream refinery capacity in the coming years. However there has not been much reported movement on their North Korean project, and the outlook will not have been improved by a 70 percent drop in oil prices since last year. While the statement affirmed HBOil’s belief that North Korea represents an “exceptional business opportunity” it also stated that the company are reviewing the implications of the recently adopted UN Security Council resolution against the country. A Mongolian oil company recently decided to withdraw from North Korea, a South Korean government source said, amid growing pressure from the international community after North Korea recently conducted nuclear tests and long-range missile launches. HBOil JSC, an oil trading and refinery company based in Ulaanbaatar, Mongolia, acquired 20 percent of the North Korean entity Sungri refinery in June 2013, valued at roughly $10 million. In May 2014, the company opened a joint venture in Pyongyang. The ex-communist country established bilateral ties with the North in 1948, but after this recent decision, the already impoverished North Korea will be further isolated from the international community. “Mongolia is sending a message to North Korea: don’t fall down the wrong path,” said Nam Sung-wook, professor at Korea University’s Department of North Korean Studies. North Korea formerly attracted foreign investment to resume operations of the Sungri refinery, which stopped running in 2009, in order to push for economic development. The deal with Mongolia, begun almost three years ago, was taken as evidence that North Korea wass seeking further investment partners-in addition to China. However, the North Korean government continually delayed the inland oil development project, failing to provide reasonable explanations. Mongolia may therefore have concluded that there was no practical benefit to continuing the project. Bilateral ties between the two countries recently turned bitter when Mongolian president Tsakhiagiin Elbegdorj said Mongolia could not endure the North’s tyranny forever, a remark made during his speech at Kim Il-sung University in Pyongyang at the end of October 2013. “No tyranny lasts forever. It is the desire of the people to live free, that is the eternal power,” the president said in his speech. After his remarks, North Korean leader Kim Jong-un expressed disappointment and refused to hold meetings with the Mongolian president. This entry was posted on Tuesday, June 18th, 2013 at 12:57 pm and is filed under Economic reform, Energy, Foreign direct investment, Gasoline, Mongolia, Oil. You can follow any responses to this entry through the RSS 2.0 feed. Both comments and pings are currently closed.